The last week in MLB was about a team in the National League signing a catcher, a pair of infielders sign with new teams, an outfielder in the American League reaches an agreement before arbitration, and an infielder undergoes surgery. The Milwaukee Brewers have signed catcher Yasmani Grandal to a one-year deal. The contract is worth $18.25 million, per Tim Brown of Yahoo Sports. Grandal deal with Brewers worth $18.25m. One year. Grandal had reportedly rejected a contract offer from the New York Mets earlier in the offseason worth over $50 million. 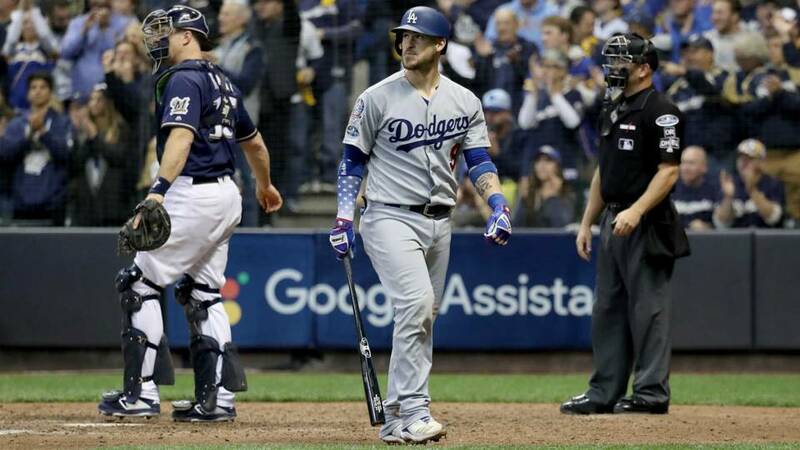 Grandal receives a solid deal for one year, and since he rejected the $17.9-million qualifying offer from the Los Angeles Dodgers, the Brewers must surrender their third-highest pick in the 2019 draft. Grandal had a solid 2018 campaign with the Dodgers as he posted a .241 batting average and .815 OPS in 140 games with 24 home runs and 68 RBIs. One reason that Grandal didn’t receive much attention from other teams this offseason is he didn’t perform well during the playoffs, specifically behind the plate as he had some defensive miscues. The Brewers have significantly upgraded the catcher position as they were going to open the season with Manny Pina and Erik Kratz as their two catchers. The club has added a solid hitter to their lineup, and though, he struggled behind the plate in the postseason, he’s typically a stout defender. His nine defensive runs saved were the second-most in the majors last year among qualified catchers behind Mike Zunino. The market didn’t quite develop for Grandal, but with a strong 2019 campaign, he could have a huge payday next offseason. The New York Mets have had a strong offseason making smart moves. The club made continued that trend a couple of days ago, by signing infielder Jed Lowrie to a two-year deal. The contract is worth $20 million, per Andy Martino of SNY. The veteran infielder was one of the better free agents available. Lowrie is coming off a stellar season with the Oakland Athletics as he compiled a .267 average and .801 OPS in 157 games with 37 doubles, 23 home runs, and 99 RBIs. Lowrie has been a steady player during his time in the majors as indicated by his .262 average over 11 seasons. He’s a versatile player who can play second base, shortstop and third base. The deal is great for the Mets as they’ve added someone who can produce, and the contract doesn’t carry much risk. The New York Yankees have agreed to a deal with an infielder, but it’s not the one you’re expecting. The team has inked second baseman DJ LeMahieu to a two-year, $24 million contract, per Ken Rosenthal of The Athletic. Source confirms: Free-agent second baseman DJ LeMahieu heading to #Yankees on two-year deal. Believed to be in $24M range. First reported: @JackCurryYES. LeMahieu was solid with the Rockies last year as he accumulated a .276 average and .749 OPS with 32 doubles, 15 home runs, and 62 RBIs. LeMahieu crushed opposing pitchers at Coors Field, as indicated by his .317 average and .793 OPS at home but regressed to a .229 batting average and .698 OPS in 60 games on the road. The infielder is a different hitter away from Coors, but in eight seasons in the majors, he’s compiled a .298 average. LeMahieu is also a stellar defender as he earned his third NL Gold Glove last season. The Yankees have a player who can hit with some pop and play solid defense. The other thing LeMahieu provides the Yankees is someone who makes contact and has low strikeout numbers. LeMahieu struck out just 82 times during the 2018 season and just once in eight years has he registered more than 100 strikeouts. LeMahieu’s ability to make contact and have a low strikeout rate will be a huge bonus to the Yankees. The Yankees during the regular season and postseason last year struck out in crucial moments. The signing of LeMahieu decreases the chances the Yankees will sign Manny Machado. The Yankees have a crowded infield with the addition of LeMahieu and signing Machado wouldn’t make sense. The Boston Red Sox and outfielder Mookie Betts reached an agreement on a one-year, $20 million contract a couple of days ago to avoid arbitration. The deal sets a new standard for players with four or more years of service time, per Jeff Passan of ESPN. Mookie Betts settled with the Boston Red Sox at $20 million, league source familiar with the agreement tells ESPN. A huge number that sets a new standard for 4+ players. His number next year, if he doesn’t work out an extension, could be gargantuan. Some more context to this settlement. Betts is a second-time-eligible player. His $20 million salary is higher than every second- and third-time-eligible player and pitcher. Only fourth-time-eligible players who got that extra season as a Super 2 have exceeded $20 million. Betts was named the American League MVP last season as he compiled a .346 batting average and 1.078 OPS in 136 games with 129 runs scored, 47 doubles, 32 home runs, and 80 RBIs. Betts won’t be eligible for free agency until 2021, but the Red Sox should consider locking up their superstar before he becomes a free agent. He will have one more year of arbitration left, and if he continues to perform as he has in prior seasons, the price next year will be higher. So, signing him to a long-term deal is very logical. The Houston Astros announced third baseman Alex Bregman underwent elbow surgery a couple of days ago to remove loose bodies. Alex Bregman underwent arthroscopic surgery on his right elbow today to remove loose bodies. He is expected to be ready to play prior to the start of the regular season. The team said Bregman would be limited at the start of spring training but is expected to be ready for the start of the regular season. Bregman had a breakout 2018 campaign for the Astros as he posted a .286 batting average and .926 OPS in 157 games with 105 runs scored, 51 doubles, 31 home runs, and 103 RBIs. It’s a huge benefit for the Astros that Bregman underwent the procedure before spring training as it provides a chance for him to recover. The Astros will need their third baseman healthy to have a successful 2019 season.